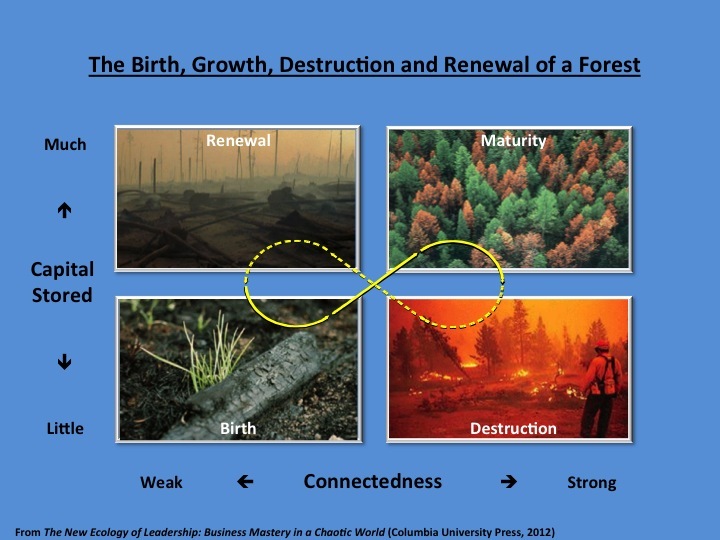 Creative Destruction: Think like a Forest! The phrase “creative destruction” has become a common one as economies and nations struggle to adjust in the aftermath of the Crash of ’08. It was Joseph Schumpeter who coined the expression to describe the workings of capitalism, and citations of the maverick economist seem to have soared in recent years. Schumpeter himself has been called a “living contradiction”, oscillating as he did between the twin poles of political economy – history and theory. In the early years of the 20th Century, a great battle was fought between the two. Theory won, leading eventually to the emergence in America of neoclassical economics, with its emphasis on equilibrium and the use of abstract models to study the real economy. Schumpeter refused to reconcile himself to this outcome and all his life he fought against what he called the “Ricardian Vice”, the tendency of neoclassical economists to mistake their models for reality. Schumpeter never came up with a theoretical framework to support his heterodox views. As a result, there are no Schumpeterian schools of economics. Mainstream economics, with its assumptions of equilibrium, cannot handle even the concept of creative destruction, let alone its dynamics. Where should we turn for insights? In this guest blog the writer David K Hurst explores how creative destruction in business can be inspired by nature. It all begins at the extreme left in an “open patch,” a space in the ecosystem that provides equal access to sun and rain. This allows small-scale experimentation without competition—at least at first. The initial colonizers of the open patch are the migrants: weeds and wanderers, like migrant birds, insects, and rodents, who are “funded” by the local seed “bank,” which contains a host of organisms waiting for the right conditions to germinate. These colonists are the entrepreneurs of the ecosystem; they invade the open space, attracted by the ready availability of small-scale resources and the absence of competition. With the easy availability of resources—relative to their requirements—everything grows. In the forest the migrants and liberated locals thrive and grow in the open patches until they start to bump into each other and to compete for resources. This emerging competition favors the greater efficiencies of larger-scale shrubs and other plants that develop infrastructure—roots to get to the water first, branches and leaves to get to the light first and to shade their competitors. Those who survive have either to dominate or find themselves a niche where they can persist. This process continues, favoring more efficient users of increasingly scarce resources due to the escalating competition, along with more inter-play and collaboration amongst niches. The shrubs are succeeded by trees, which are more efficient still. As the forest grows up, its physical scale increases enormously. In this idealized forest succession the softwood trees are succeeded by the hardwood trees. The forest has now reached its so-called climax phase; it looks green and gorgeous. It used to be thought that this was an equilibrium condition, but it is not. Indeed, the conditions are ripe for sudden catastrophe brought on by the huge assets stored in a system that has become over-connected. Too many trees are now of the same species and similar age, and they are vulnerable to the same challenges such as fire, wind, disease, and insect attack. 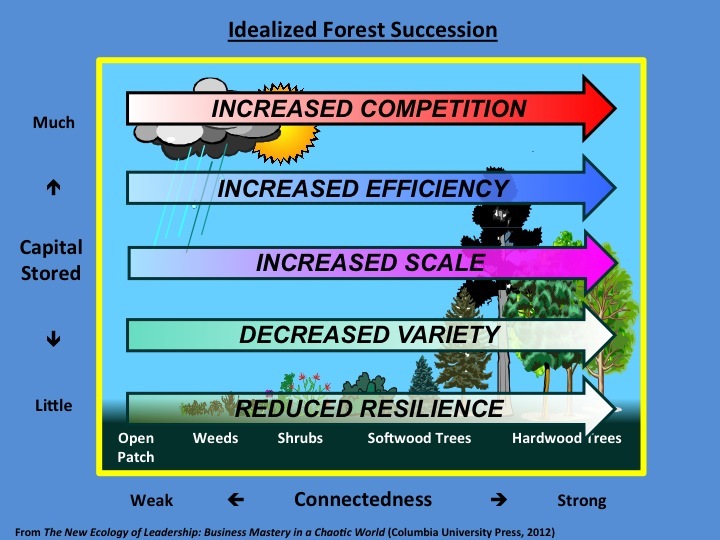 Thus, as the forest grows up, the reduction in the variety of organisms in the ecosystem leads inexorably to a lack of resilience in the face of change. A forest needs to create open patches continually to admit variety and renew itself. Destruction precedes renewal. The stylized, infinity-shaped loop contains the familiar lifecycle (solid S-shaped line) that follows the sequence of forest succession from birth to maturity. Joined to this front loop is a back loop or reversed S-shape (dotted line) that tracks the forest as it goes through the process of destruction and renewal. The infinity symbol captures the dynamics of a complex system going through an endless process of birth, growth, destruction and renewal. The growth processes on the front loop are slow, while the destructive dynamics of the back loop are very fast. It is this fundamental asymmetry between the two that makes destruction so disruptive. Fires in a forest do their work quickly, while the processes of recovery take a long time. This is why a resilient forest is a patchwork quilt of many different species in different stages of growth. The immense variety of such a system ensures that it cannot be destroyed by a single event. Analogies between ecosystems and human systems, disciplined by theories of complex systems, have the capacity to generate powerful insights into the workings of organizations at many levels. When supplemented by new understandings about human nature, such perspectives suggests that enterprises (including capitalism itself) are conceived in passion, born in communities of trust and practice, grow through the application of reason and mature in power. As they grow, these systems become modular (specialized) and stratified (hierarchical) for the very best of reasons – to preserve a recipe for success. Initially these are enabling bureaucracies, with virtuous habits that are embodied rather than imposed. Over time, however, they become structures of dominance, coercive rather than enabling, and oppressive to all who work in them. The resulting lack of innovation and initiative renders the organization insensitive to what is happening externally. As firms (and institutions) lose their ability to command resources, they become vulnerable to the organizational equivalents of wind and fire, flood and pestilence. The Crash of ’08 provides some prominent examples. Disciplined ecological analogies are ones that every modern Schumpeterian can embrace. ← Feedback, Education and the Experience Economy: Can business educate?